Discussion in 'Classic Manual Cameras' started by davecaz, Jun 9, 2018. Going through another box of eBay fodder, I came to a Konica FC-1. It's in really nice cosmetic condition, and the lens looks great, but it won't wind or fire. The mirror is in the return position, not stuck. 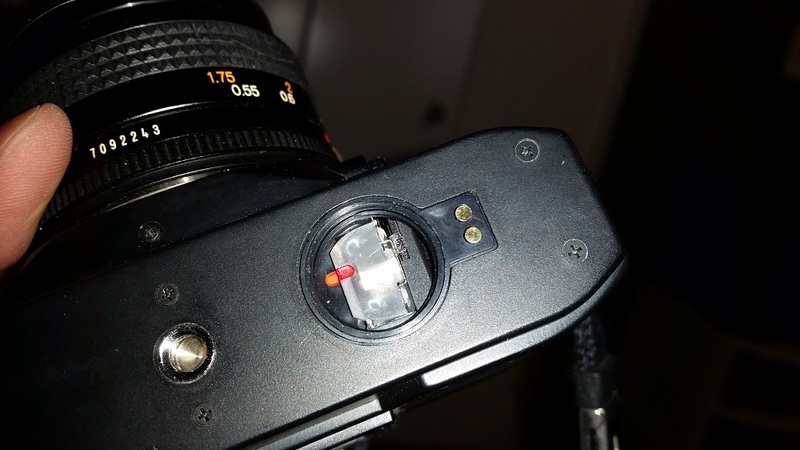 It has a built-in meter and an AE position on the aperture ring, so I thought "dead batteries?" Opening up what I presume to be the battery compartment, I found this mystery object. Anyone have a clue? It seems determined to remain firmly in place. 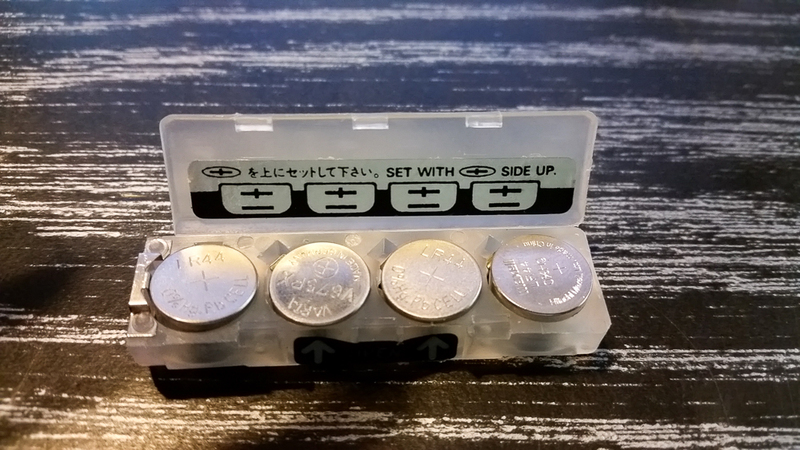 The owner's manual states: "Turn the cover of the battery chamber upside down, put its edge under the red mark of the battery case and pull up the case to remove the case from the battery chamber." It is supposed to hold 4 LR44 batteries. A nice camera to use (like the FS-1 without the winder) and not that common, I think. m42 dave beat me to it. Butkus has a manual, in this link, In page 12 it explains how to change the batteries. 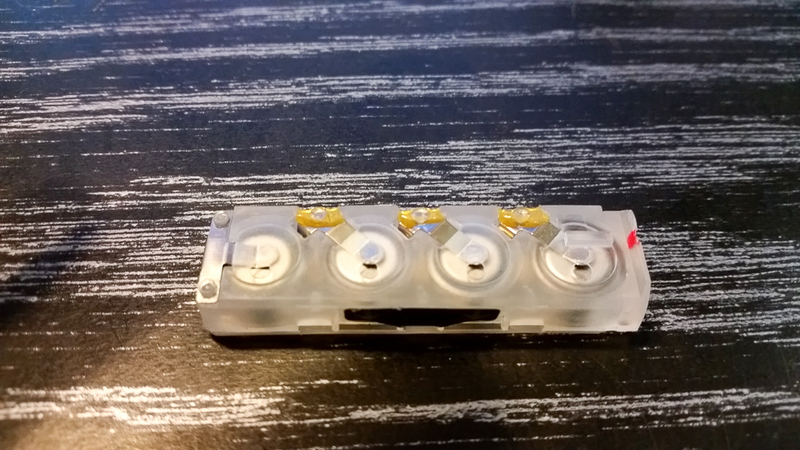 That plastic thing is a battery holder. As said above it takes four LR-44, also SR-44 or the "76" equivalent types. Please do send Mr Butkus a donation if this is useful. Thanks, Dave and Julio. I should have RTFM before posting, but I honestly thought this was some jerry-rigged modification, so I didn't expect the manual to have the answer. As it turns out, it IS jerry-rigged, but by design. This is the kind of "clever" engineering that drives companies out of business. After you pry the thing out of the camera and open it up, this is what it looks like. And from the bottom, when it's closed and full of batteries. I would hate to have to attempt changing batteries in this thing in the field. You'd be juggling the camera, the battery compartment cover, the "caddy", 4 dead batteries and 4 new batteries while keeping track of which is which and, oh yeah, the sharpened pencil or other pointy implement that is required to poke the batteries up out of the caddy from the bottom. It was a PITA while sitting at my desk. Apparently, it connects the batteries in parallel because, with 4 fresh 1.5v batteries installed, it outputs ~1.5 volts, rather than the 6v I was expecting. Which explains why they didn't stack them but, hello?! ?, ever hear of AA, or even AAA, batteries? And, after all that, the camera still doesn't work. No LEDs in the finder, shutter won't fire, nuthin'. It's too bad, because I kind of liked the look and feel of the camera, and I've read that the Konica lenses are generally excellent.